It’s not, and in fact, ketchup was originally made without tomatoes. Before tomatoes were added to the concept, the word ketchup meant a sauce, generally a vinegary one, that you bought in a bottle. There are still many different types of ketchup. Two of the oldest are Walnut Ketchup and Mushroom Ketchup. These have been joined now by more exotic ingredients such as Mango Ketchup, and Baron’s Banana Ketchup, made in St Lucia. Brits are still culturally aware of the different kinds that are possible. To this day, they still often refer to ketchup as “Tomato Ketchup” even though, truth to tell, there might be a few bottles of Mushroom Ketchup on the grocery store shelf, and 99 different brands of Tomato Ketchup. 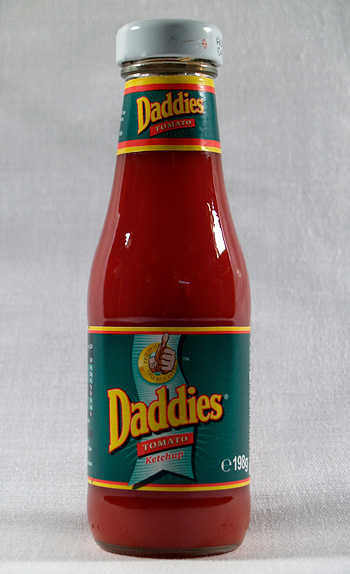 Tomato Ketchup is also still often called tomato sauce in the UK and other Commonwealth countries, but not Canada. In North America, and in Asian cooking, tomato sauce would be something you would use in cooking, but not put on the side of your plate as a condiment in itself. This differs from ketchup in that while you might put a splodge of ketchup in something you are making, such as homemade baked beans, its primary purpose is as a condiment to go on the plate. Contains from the tomatoes in it an antioxidant called lycopene, which some believe may reduce cancer risk. Ketchup as first encountered by Europeans in Asia (some say China; others say Indonesia) was a briny pickled fish sauce. It wasn’t vinegary at all; it was more like soy sauce or what we now call Worcestershire Sauce. In the 1600s, the British and the Dutch tried to imitate the sauce when they got back to Europe. In the absence of many of the Asian ingredients, they substituted ingredients they did have, such as walnuts, mushrooms and anchovies. In 1727, the first printed ketchup recipe appeared in The Compleat Housewife by Eliza Smith in England. 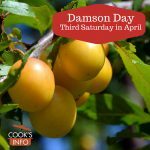 It used anchovies, onions, vinegar, spices, and lemon peel – no tomatoes. It appears to have been people in Maine who first began using tomatoes. In 1814, the first recipes for tomato-based ketchup appear in The Universal Receipt Book. 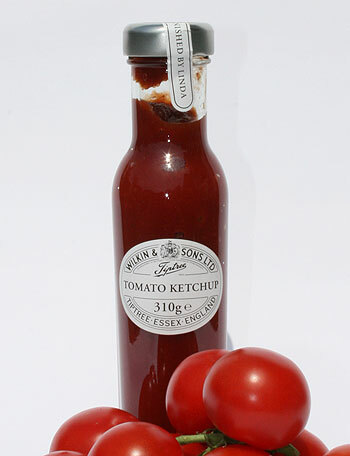 By 1834, the first commercial Tomato Ketchup was made by Bunker & Co., New York. Consumers were happy to be able to buy a premade condiment such as ketchup, because making it was a fair bit of work at a time when everything in the kitchen was already a lot of work. In the last half of the 1830s, when Americans began trying to sell commercial tomato ketchup in the UK, they were encouraged to rename it to tomato chutney, so that people wouldn’t get it confused with Mushroom Ketchup. In October 1861, Mrs Beeton published a recipe for Mushroom Ketchup in her Book of Household Management. In 1872, a company called Heinz, Noble & Co. introduced their ketchup at the Philadelphia fair — both Walnut and Tomato Ketchups. The company had been in business just 3 years: their first product was horseradish, launched in 1869. Heinz moved to a position of dominance in the ketchup market almost as soon as they entered it, because they promoted an image of producing pure, unadulterated food. In 1876, the company began selling ketchup under their new company name, just Heinz. In the 1880s, they patented their now famous label and bottle. By 1896, New York Times wrote that ketchup was the “National Condiment” in America. It wasn’t until 1946, though, that Heinz ketchup was actually made in the UK. Before then, Brown Sauce had been the preferred sauce in the UK. 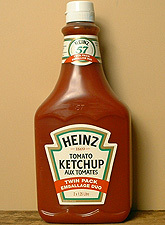 Heinz would make the ketchup in America and ship it to the UK as an imported product. Establishing production in the UK allowed them to pump up their efforts to promote Tomato Ketchup. Now ketchup outsells Brown Sauce in the UK almost 2 to 1, and Heinz owns over half the British ketchup market. Ketchup may have started off as a Malaysian word for a condiment sauce. For instance, the Malaysians still make “kechap manis”, their sweeter and thicker version of soy sauce. Or, the Malaysians may have borrowed it from the dialect used on Amoy island in China, where a local fish sauce is called “ketsiap”. English spelling variations of ketchup, katsup, catsup and catchup emerged as people tried to transliterate the word into English. In 1690, the sauce was referred to in print as “catsup”. By 1711, it appeared in print as “ketchup”. The Chinese, or the Cantonese at least, have now borrowed the word back. They call ketchup “keh-tsap” (or keh-jup, depending on the region). Even though it’s a foreign borrowing, it just so happens that in Cantonese “keh” is a shortened version of “faan-keh” (tomato) and that “tsap”/”jup” means sauce. So while you could say “faan-keh-tsap”, apparently, people might not be sure what kind of tomato sauce you meant; if you really wanted ketchup in a restaurant there, you would ask for just “keh-tsap”. Just to really throw a spanner in the works, a few sources plump for the possibility that ketchup may have come from a French word for marinade or cooking sauce, which is “escabeche”. In Britain, ketchup is often referred to as “Red Sauce”, as opposed to “Brown Sauce”, the other great favourite in Britain for topping bacon sandwiches with. In 1981, the US Department of Agriculture (USDA) decided to count “ketchup” as a vegetable for school lunches. Del Monte was one of the holdovers still spelling it catsup, so they quickly and permanently changed their spelling to “ketchup” so that they could be included in what was covered under the funding. Red-faced: Heinz ketchup comes BOTTOM in taste tests after being beaten by cut price supermarkets. London: Daily Mail. 15 May 2011.